"Grace Will Lead Us Home"
Filmed over two nights at the New Bethel Baptist Church in Los Angeles, the movie begins with Rev. Cleveland introducing Aretha, saying, “she can sing anything.” The rest of the movie aims to prove Rev. Cleveland’s high praise, and prove it it does. On the first night, Miss Franklin begins with Marvin Gaye’s “Wholly Holy” and winds with “Amazing Grace.” In between are a version of Carole King’s “You’ve Got a Friend,” “Precious Memories, and a wonderful version of “What a Friend We Have In Jesus,” with choir conductor Alexander Hamilton brilliantly leading his spirited choir members in the Southern California Community Choir in a vibrant backup of Aretha Franklin’s pure tones. Behind the choir is a starling mural of Jesus Christ just after John the Baptist has baptized Jesus in the River Jordan. During her performance, the Rev. Cleveland sits at the piano, and a couple other times, Aretha tickles the ivories. In both cases, neither she nor the good reverend skip a beat. At one point, Rev. Cleveland is so moved by Aretha’s performance that he just sits down and weeps into his handkerchief. At another point, during “Amazing Grace,” one of the male choir members just starts weeping himself. AMAZING GRACE the movie preaches the Gospel of Jesus Christ in several ways, from an evangelistic way that talks about salvation to a spiritually invigorating one that promises eternal life and fellowship with God. The lyrics inspire the crowd in the movie and the moviegoers watching the concert. However, it’s all tied together by Aretha Franklin’s pure mezzo-soprano dulcet tones. The choir is also marvelous. 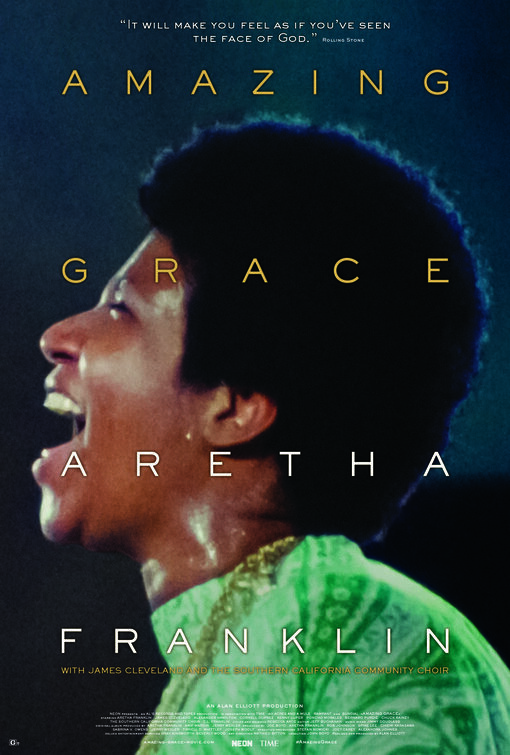 If you’re going to see one concert this year, see AMAZING GRACE, which showcases Aretha Franklin, the Queen of Soul, at the peak of her powers. There’s no objectionable content. So, AMAZING GRACE is made for all ages. An album was made during the concert and released later that year, and became the biggest selling gospel album of all time. AMAZING GRACE the movie preaches the Gospel of Jesus Christ in several ways, from an evangelistic way that talks about salvation to a spiritually invigorating one that promises eternal life and fellowship with God. The lyrics inspire the crowd in the movie and the moviegoers watching the concert. It’s all tied together by Aretha Franklin’s pure mezzo-soprano vocals. If you’re going to see one concert this year, see AMAZING GRACE, which showcases Aretha Franklin, the Queen of Soul, at the peak of her powers. There’s no objectionable content. So, AMAZING GRACE is appropriate for all ages.